This was originally posted on my other blog, It’s an Alchemical Life. There’s nothing here that is specifically about horses, though the Mean Little Black Horse makes a cameo appearance. But it’s important, so I’m including it here. 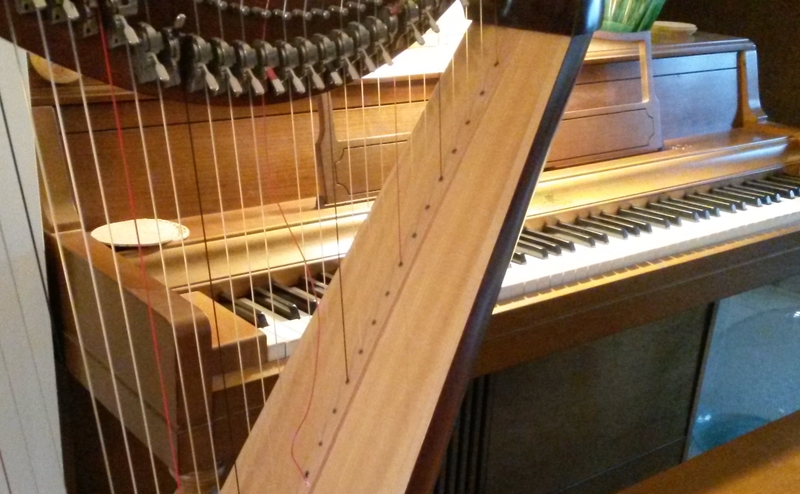 As a graduation present when I defended my dissertation five years ago, I bought myself a harp. Always wanted a harp (…and a horse…but that’s another story). Since then, I’ve noodled away at my harp, mostly in the evenings, on rainy days when I was alone in the house, or in the wee, quiet hours when sleep won’t come. No lessons, no sheet music, just me tinkling out a melody and figuring out by ear what other notes go it. Last week, a harp string broke, and I’ve not taken time to get a new one; so when the mood struck me to play something last night, I had to turn to the piano. That’s when the weirdness started. Picking out the melody of one of my favorite tunes with my right hand, I found my left hand finding chords to go along, just like I’d been doing with the harp. Suddenly, I wasn’t thinking any more. No sheet music, no nothing—just me, playing. Playing the piano. Not hesitantly, like “normal,” and not thinking about it. Just playing. Confidently, and rather loudly—gasp! Who is this playing, and what has she done with that timid Miss Kay? I kept this up for an hour or so, running through my repertoire of favorites. I’m not saying I suddenly can play the piano—it’s still very much playing AT the piano, believe me! But suddenly, something shifted and I “got” the connection between chords and melody in a way that’s never translated to the piano before in my entire life. Astonishing. My musical friends will all laugh—it’s so obvious, of course, but for me it’s always been intellectual and didn’t translate into a KNOWING that I, kinesthetic as I am, could make sense of. All my life, I’d sit down at the piano and try to read music and play songs “just the way they were supposed to be,” and I could never do it—I could never do it exactly, never memorize it and spit it back. My fingers just wouldn’t cooperate. But suddenly, there it is. Music. Chords. Now, you all know me, right? It’s not IN me to just say, “Oh, that was fun,” and let it go at that. Nope. Especially not with something so huge (to me, at least). I feel the ice breaking. It’s not just this particular breakthrough, either. For months I’ve felt a change coming. Ever since the Mean Little Black Horse Midnight broke his leg just over a year ago, my life has kind of fallen apart. Nursing him back to health over the winter forced me into relative inactivity. Just as he healed, pain in my jaw and an injury to my own knee forestalled my return to “normal life.” Then this fall, cataracts and the upcoming surgery to correct them meant I had to give up driving and a lot of my freedom. Something, clearly, is incubating. But what? Dear Reader, I still don’t know. But whatever it is, it’s coming…and soon. And the understanding is dawning. There was a new freedom in my playing last night. I wasn’t in my head, trying to “play the right notes” or “read the music.” Instead, I just opened up to what my fingers actually know. My ego stepped away from center stage. In the experience and in a metaphorical sense, it was like letting go of the rules that I have tried so hard to live by, in my life and in my playing. It was like opening up to not knowing what it is that I’m “supposed to do while I’m here in this life,” and allowing for the possibility that I am actually doing “what I am supposed to be doing while I’m here,” just by being who I am. There’s a growing trust in the process of Life—I first remember hearing that phrase more than 20 years ago: “Trust the process.” And I have done that, much more over these last 20 years than I ever did before. But the idea and the sense of relaxing into trust is new to me. It’s a letting-go—a realization that I never had any control over anything much anyway. There are always choices to be made, and each choice has consequences; but I never have had control in the sense that we like to think of it. And suddenly, I find myself just fine—happy, even—with that fact. I find myself being surprised at what happens each day, and being excited to see what’s coming next—it’s a very different way of looking at the world than I’m used to. I know that’s part of what’s going on. The best part of all this? I am so full of joy! What the heck is this?! Creativity, love, freedom, all those wonderful things—just welling up inside. Wow…. Thank you, God. Freedom … freedom from fear, mostly, I think. And there’s love. Lots of love. And more to come!